Artwork is a big deal, especially when it comes to our children. It can be so hard to part with something they put their heart and soul into…those little hands only remain little for so long, after all. However, at some point it can begin to take over the house. I know my kids make me some sort of masterpiece daily…and with 6 kids, that can add up to a lot of masterpieces very quickly. So, how do we tame the artwork clutter? I realize that though this task will only take a few minutes to actually see through, the hearts of our children are worth far more than that. I found it helpful to talk with my children about holding onto memories instead of possessions. Some of my kids have a hard time letting things go, so it takes me more time to work with them before I can let go of their artwork. I am ok with that, and if you find yourself in the same situation, just know that it will take time and the important thing here is to begin the process. 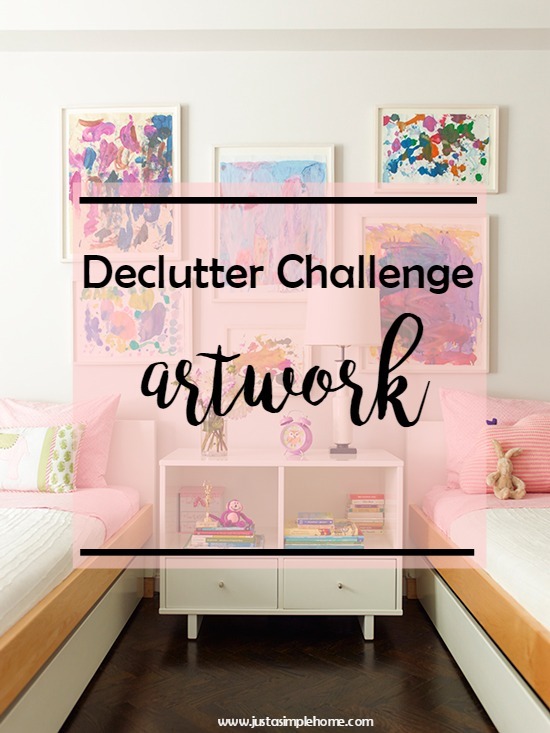 Gather any artwork that your children have made from your walls, their bedrooms, the fridge – where ever it may be lying around. Discard any artwork that you know you don’t need anymore, but before you do consider if it has an emotional value to you or your child or if it was a gift. Those are reasons I know to keep artwork. Take pictures of each piece of art so you can make a big collage of photos to hang up. 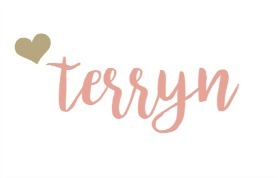 You can also use these photos and create a scrapbook of all the artwork. Designate one corner in your home as your ‘wall of art’ and hang up the creations for a set amount of time. Tell your children you will rotate their artwork at that set time. Frame the special pieces and hang them on your wall, in a beautiful display. 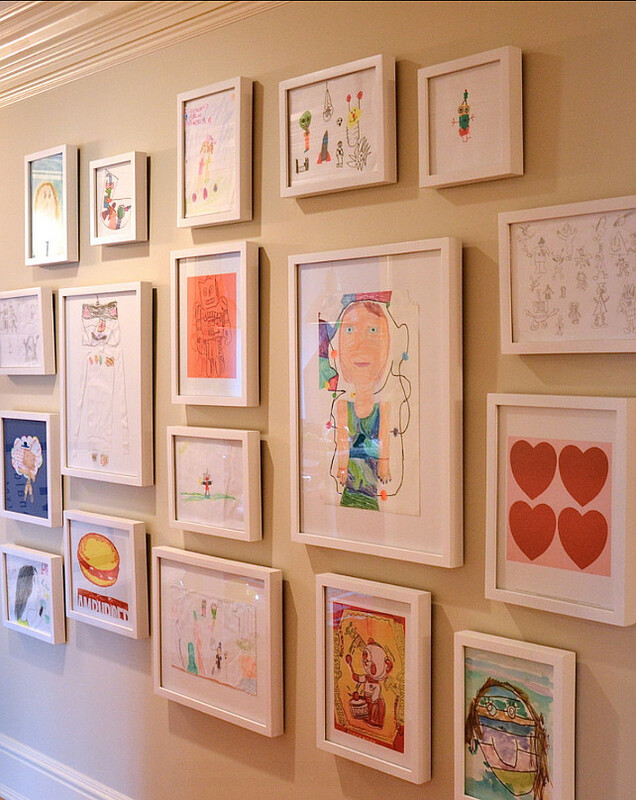 Here is a gallery wall used for children’s artwork. 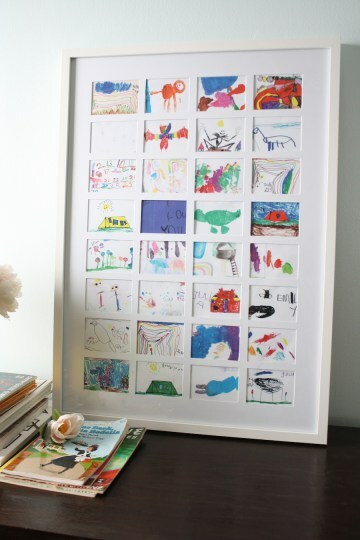 I just love this idea of keeping your child’s artwork beautifully displayed. You can see exactly how to do this yourself here.